The theory of evolution explains how living organisms change to suit their environment. This has become a topic of debate in the USA because of the 'intelligent design' theory. 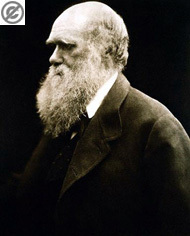 Darwin is as famous as his theory. He was born in Britain in 1809. As a young man he went on journey aboard the HMS Beagle, as a naturalist and spent 5 years travelling the world and documenting the wildlife he saw. Of particular importance was his visit to the Galapagos Islands off the coast of Ecuador. Here he saw many strange animals (the islands are quite isolated) that made him start to think about natural selection. He returned home and spent his time studying many things from earthworms to barnacles. He was worried about publishing his book on evolution because of the controversy it would cause; however, he found out that a friend was coming up with a similar theory, so The Origin of Species was published. The book did prove controversial but also very popular at the same time. Darwin died on 19 April 1882 (aged 73), leaving a great legacy: changing the way Biologists think about life and becoming internationally renowned with his name and photograph being instantly recognizable to this day!. Evolution claims that small variations in living things may produce a more desireable characteristic that enables it to survive better and so it will to able to reproduce more, passing on this variation to some offspring. The offspring with the variation will also live longer so reproduce more. And those without the variation have a lesser chance of survival. And eventually all of the species has this trait. Accumulated changes eventually lead to new species being formed. Within a species there may be significant variation. Take humans for example, there are differences in height, body shape, intelligence and so on. And some of the many differences may give an organism a selective advantage. This means they will be more likely to survive and hence pass on their genes to the next generation. As an example to illustrate, we shall look at the Peppered Moth (Biston betularia). It had two varieties: one that was light and one dark. The light coloured moths were camouflaged on the trees they lived on, and the dark coloured variety were more easily seen and hence eaten. Therefore there were far more light coloured moths. However, during the industrial revolution, the trees they lived on became dark with pollution, and now the darker moths were better camouflaged and the lighter moths eaten more easily. 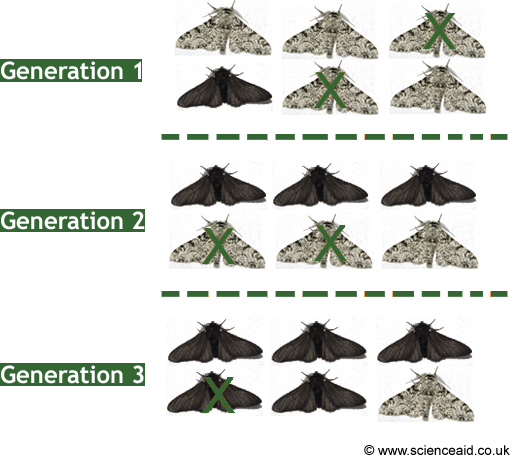 The diagram above graphically illustrates how the darker moths become more numerous as the lighter are more likely to die. This eventually lead to the light moths being extinct in the cities.